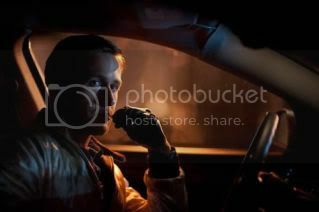 Drive is the sort of film that reminds me of a lot of other films. Melville’s Le Samouraï immediately came to mind, as did John Boorman’s Point Blank and more recently, Anton Corbijn’s The American. What Drive has in common with all these films is a central stoic figure whose quest for vengeance is rattled or shaped by a love interest. And perhaps the most interesting aspect to all these films is how closely related love and violence can become. 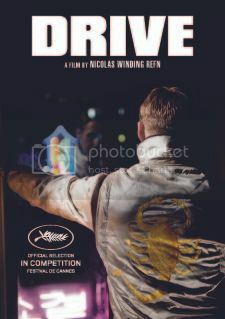 Drive has the most overt way of addressing this theme, as Refn acknowledges the correlation between love and violence within the confines of one spatial setting, wherein the lights dim to distinguish love in all its unreality. This act of love is followed the film’s most grizzly death. This sort of love-violence paradox would normally turn me off from a film entirely, particularly when the violence is as sensationalized as it is in Drive. But there’s something to be said about the way Refn frames his images. Each frame carries such a weight of intensity that it’s hard not to get involved in Ryan Gosling’s stoicism or Carey Mulligan’s earnestness. You eat up Albert Brook’s gangster aura and sympathize with Bryan Cranston’s never-was role. This sort of simple dedication to characters and types allows for Refn to get away with some of Drive’s more lurid and violent inclinations in the second half of the film. Hell, even at its grizzliest, Refn manages to take ideas and scenes (like the final encounter between Albert Brooks and Ryan Gosling) and turn it into an incredibly rich and impeccably shot clash of shadows. There’s something to be said about Ryan Gosling’s transformation in Drive. He moves from a character defined by his occupation and connection to cars (from grease monkey, to stunt driver, to crook), to someone seeking an identity through a woman. Like George Clooney’s role in The American, Gosling’s empty life demands someone worth fighting for. It’s through that fight that we juxtapose into a narrative. But the beauty and heart of both films come from that initial feeling out process wherein both Clooney and Gosling attempt to understand what they are doing by letting these women in their lives. What sets Drive and The American apart, despite the obvious, is their philosophies on what to do in the end – in one, we see our hero return to his woman in wounded state, in the other, we see our hero leave her forever. It’s an odd remark to make, but in a week where a remake of Sam Peckinpah’s Straw Dogs breaks into theaters, I’d wager that Drive has more in common with Peckinpah’s ideology than Rod Lurie’s remake ever will. Like Peckinpah’s best films (Straw Dogs and Bring Me The Head of Alfredo Garcia), Refn manages reconcile my disdain for overbearing masculine bravado with stellar direction and a refreshing take on the definition of masculinity. The fact that Drive won me over so decisively, despite my resistance to films of its type, really shouldn’t be understated – it’s terrific.